The manuscript should be written in English and should have maximum length of 10 pages. A clear and concise language will help editors and reviewers concentrate on the scientific content of your paper and thus smooth the peer review process. The papers should be prepared by TeX editor according to the template. The template and an example can be sent by e-mail upon request. Please contact proceedings@ysu.am for details. The number of figures should not exceed 5. The figures should be located within the text according to the template example. All figures should be included both in EPS and PDF formats. The first page of the article should contain the article title, the full name, complete institutional affiliation and e-mail address of each coauthor, and an abstract. The abstract should be no longer than 100 words. The abstract should be followed by Keywords and, if applicable, by MSC2010 index. 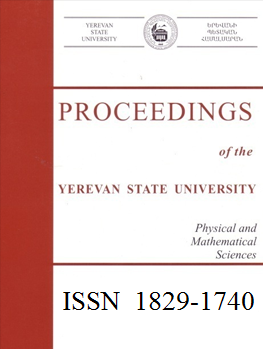 The authors are required also to attach the Russian and Armenian language versions of the abstract, separately in Microsoft Word format. The references should be formatted according to the example, provided in the template. We encourage the use of BibTeX format for references. Submission of the Manuscript. The authors are requested to submit one hard copy and the electronic version of the manuscript. Only papers not previously published will be accepted and authors must agree not to publish elsewhere a paper submitted to and accepted by the journal. By submitting a paper the corresponding author confirms that its submission for publication has been approved by all the coauthors. Pre- and Post-Printing Process. If the manuscript is accepted for publication, the corresponding author will receive the galley proofs for proofreading. After publication, coauthors will receive 5 reprints and the corresponding author will receive a hard copy of the journal free of charge. Please contact us at proceedings@ysu.am for further details, or click here for getting the LaTex template.